Tottori city is located in Tottori prefecture. It is about one and a half hours from Yonago city, and almost three hours to Okayama city. 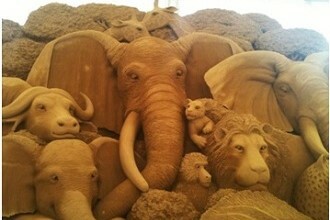 Tottori’s hot tourist spot is the sand dunes. The sand dunes were created over thousands of years. The sand dunes together form the only dune in Japan, reaching 50 meters height and are up to 2 kilometers wide. The constant tide changes and coastal winds are always changing the dunes’ landscape. To really experience the dunes, tourists can ride camels or horse drawn carts. People can also go paragliding or sandboarding through local companies. The natural beauty of Tottori, specifically the mountains, offers great places for snowboarding in the winter. There are also many beaches for a sun tan in the summer, and hot springs to unwind in after a long day. Due to Tottori’s close proximity to the ocean, seafood is a popular dish. Snow crabs, or matsubagani, are firm in flesh and superior in sweetness. These crabs are a must-try winter delicacy! I like the small things in my city, I like that the workers at the flower shop and locksmith that I walk by on my way to work always bow a little and we exchange smiles. I like that I can walk around at just about any time of the day or night and still enjoy people watching. Recently I went up to Arashiyama with my sister and her husband and a her friend. We started the day by walking through the bamboo grove that you see anytime you Google search “Kyoto”. At the end of that walk we got on a little train that took us through the hills and gave some nice views of little gorge that I have to go back to in the autumn because of the greenery. After the train ended we hiked up to a monkey park where monkeys walk around freely and you can feed them if you enter a certain building. (Just don’t look them in the eye, they’ll get mad!) We walked around the old city streets and got some Japanese paper umbrellas for mother’s day. We got a few traditional snacks and then went to Osaka to get some Kushikatsu in Shinsekai.